The use of digital technology to sell products to consumers in stores has become more and more prevalent in recent months. In fact, big brands like Procter & Gamble have recently started testing this technology in Walmart locations in an effort to better target consumers on the verge of making purchasing decisions. Adweek.com reported on how P&G is testing this ad targeting technology to assess the response and results. 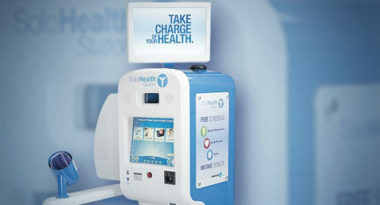 The testing involves the use of special SoloHealth touchscreen kiosks that have been placed in more than 400 Walmart digestive health sections. The touchscreen prompts consumers to enter their gender, age, and ethnicity before showing them a video ad for ZzzQuil or Pepto-Bismol that has been tailored to their demographics. Consumers are then asked to provide their email addresses and cellphone numbers to receive electronic coupons and information about their health based on the kiosk’s assessment. Early data has indicated that approximately 10 percent of consumers shown the video ad have provided their personal contact information. This high rate of response has many big brands excited about the potential for this in-store ad technology. These in-store kiosks hold numerous attributes. First, they have the ability to customize the video message based on the consumer’s demographics for optimal targeting. Second, their convenient in-store location places the advertised product literally within the consumer’s reach. Lastly, they can collect valuable consumer data by offering incentives like coupons and additional information. The kiosks were initially tested in Atlanta Walmart locations last year before being rolled out to other Walmart stores last month. The kiosks have also been offered to CPGs in Safeway stores. Beyond retail stores, the kiosk is now being tested by luxury car brands like Lincoln. For the luxury market, the technology has been designed to let customers hold a live online chat with a Lincoln representative while researching their various vehicles. That agent then can provide the details for the specified models to local dealers. When the customer arrives at the Lincoln showroom, they could instantly continue the conversation with an iPad-toting rep. This would save the customer the hassle of repeating their specifications by allowing the rep to simply view their prior digital conversation. The technology’s early success has other brands and industries intrigued by this digital targeting method. Now, time will tell whether the ad targeting technology can produce the desired effects. To learn more about the power of digital technology to sell products, contact MDG Advertising. MDG Advertising, a full-service advertising agency with offices in Boca Raton and New York, NY, is one of Florida’s top integrated marketing agencies. Our 360° approach uses just the right mix of traditional and digital marketing to reach your advertising goals. While some industries may fare better in print or TV advertising, and others online, we strive to create a balanced approach, where traditional and digital marketing efforts support each other and your message is tailored to the medium. To learn more about the latest trends in marketing and advertising, contact MDG Advertising.